Megabus information changes quickly. All riders should pay careful attention to confirmations and check the website for stop updates. Megabus has again changed the bus stop. It's now located in a parking lot about 3+ blocks from the prevous stop at the LYNX station. Riders can leave a car and catch the bus in the same place. Readers will want to check out the "read more" link below for more information. 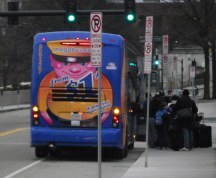 The move is both good and bad for Megabus customers. Riders with a car who are leaving Orlando may enjoy the convenience of the new stop. However: anyone who wants to catch the LYNX to Disney or other places may find the stop to be a little inconvenient. The link above has more information. Many thanks to the blog reader for the tip. I confirmed that the Megabus stop at the Econo Lodge on International Drive is now closed as of May 23. Per staff at the hotel, the Econo Lodge is undergoing a six month multi-million dollar renovation. There is no word on a new stop as of this date. This link on How to get to Disney from Megabus in Orlando may help you find your way. I just found out that there are now two Megabus stops in Orlando. Megabus says that the first stop is still at this Econo Lodge Inns and Suites near Universal Studios. The stop is on the north side of the hotel. Shuttle service is available to the parks. Read my review on it here. Stop number 2 is in downtown Orlando, Florida. Vistiors can find in the W. Jefferson St. Parking lot between North Garland and North Gertrude St. The website states that parking is available for riders in the lot. However; all vehicles must display a permit that is attached to the confirmation. Check the above link for more information on both of the Megabus stops. It's the best way to determine which one is the best for your needs. Read more on Youve Been Reviewed. Would you by chance know if the new MegaBus stop is near any forms of public transportation? Thank you, so much for this information. I am planning to take the megabus ride to Orlando this July. You are welcome. I hope that your trip is a blast! Please come back and let us know how well it went. Enjoy Orlando! Im looking to take another bus when i get to orlando to miami is there service around the area? I hope these help. Feel free to email me at youvebeenreviewed@gmail.com later on. It will be great to know how your trip went. I'm going to drive to Orlando to catch the Mega Bus. Do any one have some type of information on where to park you vehicle for a couple of days. Hi Lashonda, Megabus just changed the stop and is now located in a lot where you can leave a car. The change took place yesterday. Here's a post that may help. http://www.youvebeenreviewed.net/2014/05/where-to-park-at-megabus-stop-in-orlando.html I hope you have a great time on your trip! Summer is a fun time to travel. I'm going to be driving to Orlando in June to catch the Mega Bus, can anyone tell me where I can pay to park my vehicle once I get there? THANKS ALOT GUYS .. I really did what y'all said and me wife and kids had a blast for the weekend.. I can answer all question .. I caught mega bus this weekend from New Orleans to disney world .